Info: 3 BR, 3 BA Home with over 2200 sq. 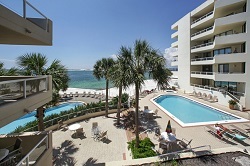 ft.
Destin resort home, East Pass Towers condo for sale. Enjoy the popular coastal lifestyle at this waterfront home on the Intracoastal Waterway. This beautiful resort residence has spectacular views of Santa Rosa Sound, Okaloosa Island & the Gulf of Mexico. This home has numerous upgrades and a neutral decor, the condominium is turn-key ready. Deeded, 50 foot, deep water boat slip & covered parking space. Come see this amazing waterfront home, East Past Towers Condo in Destin Florida.